LVL1 has a new rocketeering group. 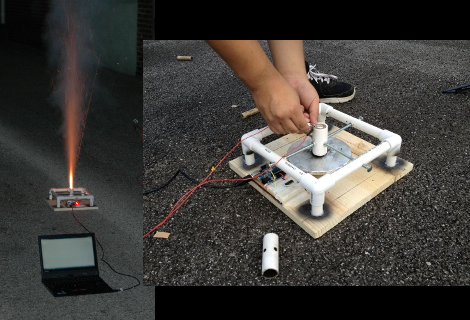 This rocket engine testing platform is the first project to come out of the fledgling club. The purpose of the tool is to gather empirical data from model rocket engines. Having reliable numbers on thrust over time will allow the team to get their designs right before the physical build even starts. The rig uses a pine base, with a PVC frame, threaded bolts, and a PVC cuff for mounting the engine in place. It is set to fire up in the air, directing the thrust down onto a scale. The flex sensor in the scale is monitored by an Arduino, and should be able to hold up to the 5000 pounds grams of thrust max which this type of engines can put out. The data is pushed via USB to a laptop computer where it is stored in a spreadsheet. Calibration would be an issue here. But as long as they’re always using the same strain sensor the numbers will be accurate enough relative to each other. That is, unless the sensors drift overtime as a result of usage. For example, they might begin to think their engines are getting more and more powerful, when it fact they’re not changing, if they don’t occasionally re-test old designs. I guess model rockets don’t go high enough for their thrust profile to be affected by altitude. The fuel and oxidizer are all part of the rocket. Altitude should have nothing to do with this motor’s thrust. Not true, actually. While the altitude doesn’t affect the combustion of the propellants, it does affect the performance of the nozzle. Ideally, the nozzle should expand the gasses to match atmospheric pressure. As you ascend, though, this falls. This is one of the many reasons that rockets are generally staged. I suspect ‘5000 pounds of thrust’ is a little optimistic for this type of set up. The figure of 5000g mentioned in the article is perhaps more realistic. Pity. My plans for a personal space shuttle will have to remain on hold a litle while longer. Those must be magic bolts (the retaining mechanism) in order to hold 5000 pounds of thrust. 5,000 lbs of thrust? Is that a typo? I don’t see how that rig could possibly accommodate an engine capable of producing that much thrust. I so hope 5000 pounds is not a typo. If little model rocket engines can toss a car up into the air, I am going to really be amused when they arrive!!! Calibration should be trivial; just place a calibrated weight (or any weight as measured by a calibrated scale) on the force sensor. A calibrated, or confirmed, weight would be fine to confirm a single point of calibration, as long as the same weight, or a weight of similar confirmed size and mass, was used before each test. For better grasp of the sensor’s performance throughout its operating range, you should use at least three data points around the low, mid-range and high points in the sensor’s range at a minimum to confirm accuracy. Even in model rocket science, accuracy does count. Load cells, such as they’re using here, are standard components in electric scales of all sizes, and they’re extremely linear. Calibrating them at 0 and a known weight is sufficient. NEWTONS OF THRUST ! you had one job to do. This is a result of the poor standard of reporting pounds force as simply pounds which causes confusionnwhen referring to pounds mass. Really, can’t we just start using slugs? Agreed – in the S.I. system thrust is measured in Newtons. In American measurements Pounds are used for both mass and weight and too many people automatically just assume the 2.2 lbs = 1 kg. conversion even though that only holds true for mass. While this is an interesting build, it’s essentially just a fancy electronic scale. You could just use an off-the-shelf USB scale (for postage, kitchen, or similar use) with a frame to hold the engine. For model rocket motors the thrust curve is pretty simple, but more sophisticated engines build up to thrust (fairly rapidly) and the thrust curve can be calibrated depending on the design requirements). It would be very interesting to constantly read the thrust from the motor over time and plot the thrust curve. See http://www.grc.nasa.gov/WWW/k-12/rocket/rktengperf.html for some model rocket motors. Of course the real challenge would be to build a setup in a vacuum chamber to verify the operation of the rocket at high altitudes. A strain gauge, or load cell, is exactly what powers digital kitchen scales, and it’s what they’re using here. But the scale has the additional ability to be tarred, which there rig doesn’t seem to have. That’s purely a software feature: record the output value of the instrumentation amplifier at 0. Your right, I thought of that after I replied to you though. Thanks for the feedback everyone! It’s greatly appreciated! I too was shocked to learn about my scale’s hidden ability to handle 5000 pounds haha. Am I the only one concerned that if some slight malfuction/loosening/etc of the retaining bolts would occur, you’d have a loose rocket?